As we just reported, Verizon is expected to finally launch the Samsung Omnia II on December 2nd. Set to price at $199.99 after a $100 mail-in rebate and your John Hancock on a 2 year contract, the handset will ship with Windows Mobile professional 6.5 which could be why Verizon made everyone suffer through the long wait. The 3.7 inch AMOLED display, TouchWiz 2.0, 5MP camera and 8GB of internal memory all helps justify the price, which matches the cost of the Motorola DROID. One of our ninjas always carries a camera with him and he stealthy snapped a couple of pictures of the Omnia II for-as always-your viewing pleasure. 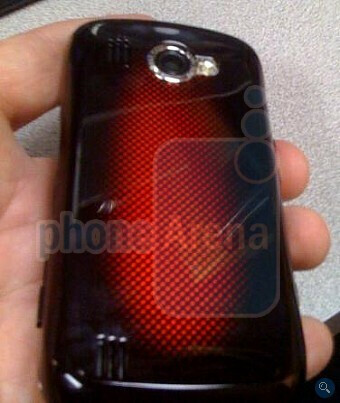 Note the new fashion pattern that the back has, similar to what we've seen in recent European Samsung models. If you cut out the front and the back photos and tape them together, perhaps you can convince yourself that you have the device in your hand. That will have to do until December 2nd, when you should be able to walk into your local Big Red retail outlet and pick up a real Omnia II. Looks like the Rogue, and probably crap. Samsung hasn't come out with a quality phone for Verizon. i agree, looks like they just took the rogue and added windows to it. two thumbs down, i'll stick with the droid! Almost Truth... the i910 Omnia I was good..... AFTER you flashed a custome rom that removed all of the VZW crap that comes preinstalled like Visual Voicemail, VZNav, ShitSync... I mean WirelessSync, etc. We'll see how this does. 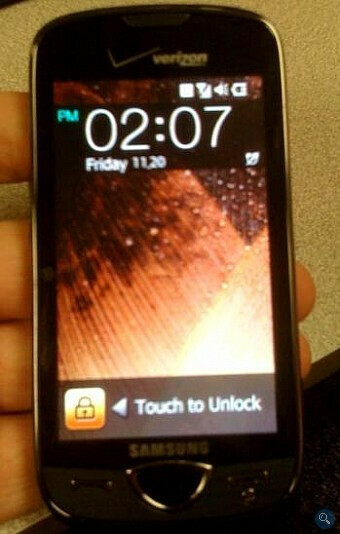 I was excited for this phone in august, but now I will wait for the next HTC HD2 or Passion. Played with the phone for 2 minutes and is almost exactly like the Rogue in terms of the look and the touchscreen is pretty much more of the same. It feels sluggish, eventhough most winmo phones feel sluggish. Stores should of already got there live model of the phone. I played with it today and it's slow and sluggish... But man does the outside and the screen look amazing on this phone. But just being pretty is not enough these days, I already have an IPhone on my work demo line that does nothing but be pretty. Typing is sluggish, but the cool move your finger without lifting and drag to each letter and it types thing is kinda cool. Other than that.... ehhh. Oh and for those that think the cube will move by moving the phone using the motion sensor... wrong. Somehow this did not make it, you must spin the cube yourself. No matter how lightly or vigorously you try to spin the cube it spins a ton before landing on the right thing and it spins a little too much. It's kinda ridiculous, you guys will see what I mean. I could be mistaken, but that does not look like the Omnia 2 on Samsungs website. I think they've got the wrong phone.